Aluminum bleachers have always been a popular and economical option for adding seating capacity, whether they’re your primary or secondary, permanent or temporary, or inside or outside choice. But with bleachers being a popular choice, accessibility is also a concern, meaning that there should be the same options in seating choices for every possible user. That’s where The Americans With Disabilities Act (ADA) steps in, providing guidelines for aluminum bleachers regarding seating requirements, layout, and also the individual bleacher components. But this doesn’t mean that older, previously constructed venues shouldn’t adhere to those guidelines as well. It has been noted that any venue built prior to 2005 is likely to have some issues regarding accessibility. 0 – 500 seats. There should be at least 5 designated wheelchair spaces with companion seats available. 501 – 5000 seats. The venue is mandated to provide at least 6 designated wheelchair spaces plus companion seats, plus 1 additional wheelchair and companion slot for each additional 150 seats over the 501-seat benchmark. 5000 seats or more. The venue will provide at least 36 designated wheelchair spaces with companion seating, plus 1 additional wheelchair and companion slot for each additional 200 seats over the 5000-seat benchmark. The numbers are a bit different for newly constructed stadiums. In new stadiums and other assembly areas, at least 1 percent of the seating must be designated as wheelchair seating, strictly defined as “a seating location that is an open, level space that accommodates one person using a wheelchair and has a smooth, stable, and slip-resistant surface”. These seats are to be integrated so that they are not isolated from other seating, and have the option of a companion or guide seat next to them. 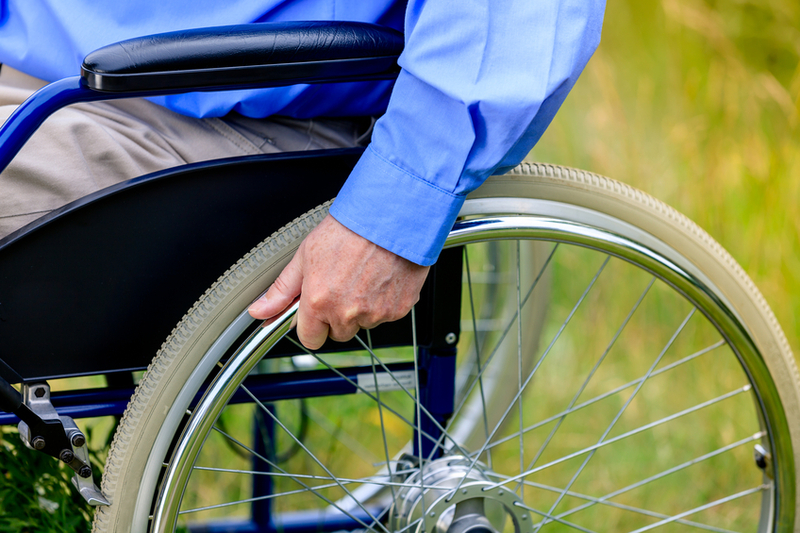 In these instances of having a number of designated wheelchair spaces, the facility management is allowed to have fold-up or removable seats on hand to use to fill in the unused wheelchair spaces during events. This will help the facility to be able to still get ticket revenue should those spaces not be used for wheelchair patrons. Additionally, ADA seating requirements state that at least one percent of all fixed seats, including aluminum bleachers, must be aisle seats with no armrest, or having an armrest that is removable or able to be folded up and out of the way on the aisle side. Also, wheelchair designated areas are to be located on or reasonably near a route that easily provides access to and from parking and transportation areas, restrooms, concessions, etc. Other public and common use areas, including locker rooms, stages, warm-up areas, dugouts, press boxes and the field are to be also located along wheelchair accessible routes, which typically end up being the same routes used for participants, employees, and any other person needing access to any specific area at any given time. Proximity and ease of access to other amenities always needs to be considered. The wheelchair assigned seats should be dispersed both vertically and horizontally throughout the stadium, within all ticket price levels and at comparable viewing angles and line of sight locations as the other seating options. But it doesn’t end there. The individual components that make up aluminum bleachers need to be compliant as well, meaning additional safety precautions and designs. Things like the stairways, ramps, hand railings, the flat walking platforms, and the signage around and on the structure are important and integral components, according to the ADA. Safety precautions for aluminum bleacher use and ADA compliance go hand in hand. That is why all aluminum bleachers under consideration should adhere to International Building Code (IBC) requirements. Landings, walkways, and other flat areas. General walking and public movement areas of aluminum bleachers need to be slip resistant well marked, with a clear line of sight moving forward. While they may be raised somewhat, for example with elevated aluminum bleachers, they may not hinder or obstruct the view or line of sight of other spectators. The walking and traffic areas should be wide enough to accommodate all users, including companions and guides if needed. Ramps are essential for those needing wheelchair, stroller, scooter or companion/guide assistance. It is recommended that ramps are located at a primary or main entrance point, and constructed so as to be slip resistant. Additionally, the grade and slope of the ramp are to be within specifications, which can vary state by state. The ramps may include textured edges, protection from sharp edges, and handrail access on both sides. Ramps should be wide enough to accommodate side-by-side use of companions and/or guides, if necessary. Hand Rails. Railings, whether near walking platforms, traffic areas, or on stairways should take into account the space and reach requirements for all intended users. If needed, extensions can be added to achieve these requirements. Hand railings for stairs are expected to be available on both sides of stairs where possible, as to accommodate all users and companions at the same time. In other instances, handrails may be located in the middle of the stairs, allowing the user to choose which side of the handrail is the easiest and safest for them to use. It is recommended that stairways be constructed to be slip resistant and plainly marked. Special attention should be paid to the treads of the stairs, with recommendations of curved, bevel type edges to increase traction and reduce the possibility of slippage. The stairs should be wide enough to be prosthetic and range of motion-friendly, along with being compatible with those users needing canes, crutches or other walking assistance devices. Visual Indicators and Notifications. Many tools are available and useful as visual aids. Different sections of bleachers can be color contrasted to visually differentiate the areas and seating options. Bleacher covers are one easy option. Additionally, surface mounted indicators can be installed at the tops and bottoms of stairs, and along the perimeters of walking areas, stairways, and ramps so as to signal entrances, exits, or potential hazard areas. Aluminum bleachers are a great and economical seating resource for assembly areas, event venues, functions, and sports entertainment. But the only way for everyone to be able to enjoy those functions is to have bleachers constructed in a way that everyone has the opportunity to share the same experience, in the same manner, no matter the disability. ADA bleachers are a sure way to give that opportunity to everyone. 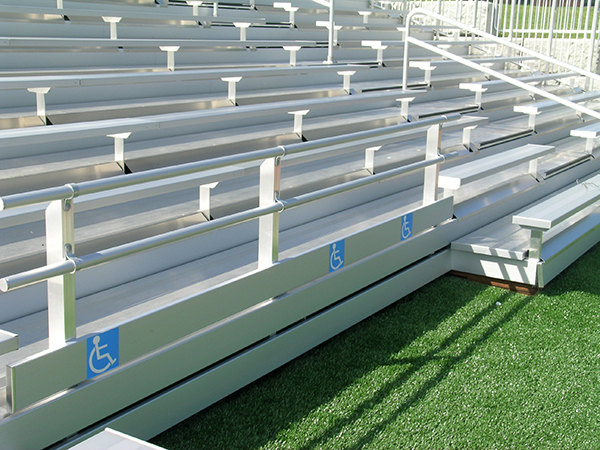 Many manufacturers of aluminum bleachers can design their bleachers to meet specific ADA requirements. Every state is different. 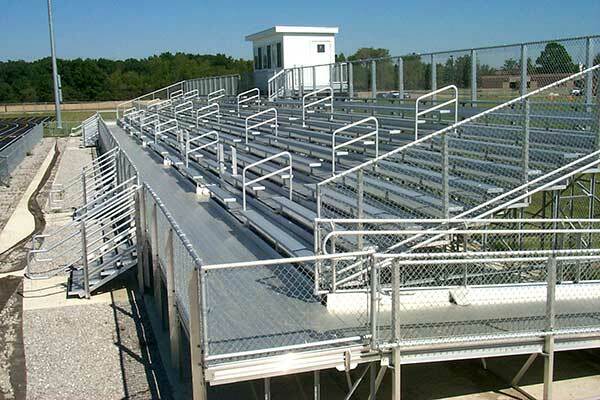 Call the staff at AluminumBleachers.com for information on ADA compliant bleachers. Aluminum ADA bleachers with a cutout for wheelchair access.